How has your January been? I don't know why, but for me, the first month of the year tends to be rather hard. There are always some things to tackle with and I really have to work on my mental and physical state to stay sane. But there are also some breathtakingly beautiful moments. Like one night at our cabin, when I went outside and my jaw literally dropped. It was a really crispy winter night. There was a humongous full moon and the sky was super starry. Thick white smoke came out of our chimney and I stared at all these beautiful long spruces that are surrounding our handbuilt cabin. Nature. Wow! And lounging on our warm rocket stove and reading some good books. Or watching really old episodes of our favorite series. Or doing yoga on my mat just to stretch after many hours of work behind my computer and really enjoying it. Many beautiful things. And delicious food! If you have been a frequent visitor here, you may have noticed that sometimes I really love to cook and eat veganized versions of old retro classics. 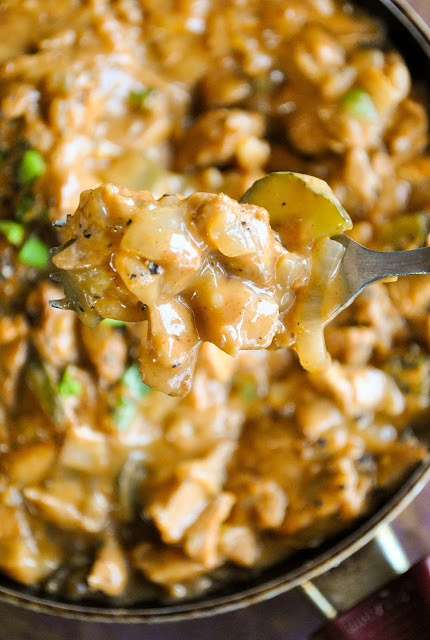 Like this stroganoff. A real classic when it comes to a hearty lunch and meat and potatoes kind of meal. This time, I used soy slices to make it similar to the original. 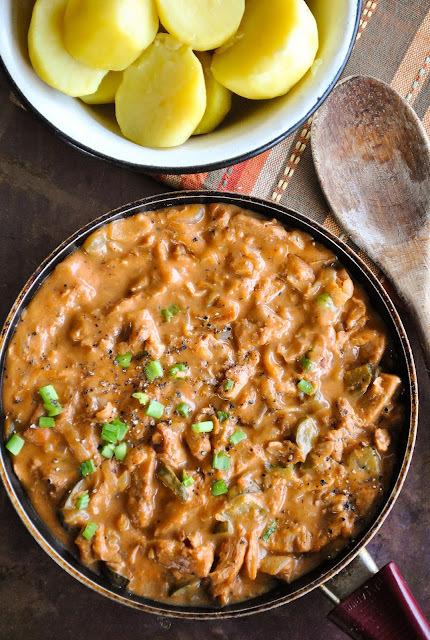 If you are not a fan of soy, I have also created a fabulous recipe for lentil stroganoff. The thing with dried soy products is that a proper preparing technique goes a long way. I have discovered a pretty good one, so stay with me. 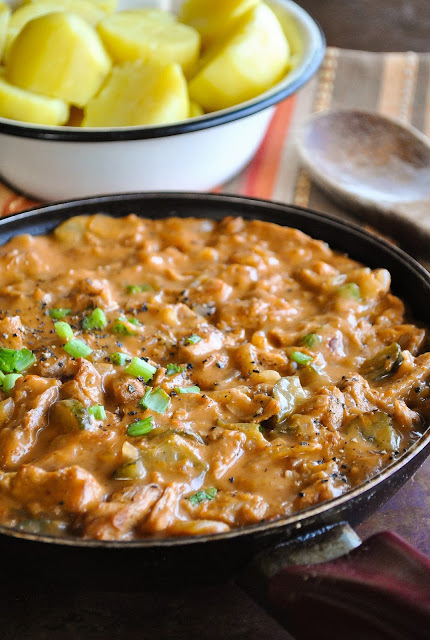 This delicious stroganoff is really filling and just perfect with good old boiled potatoes. And maybe some fresh salad as a side? A really sturdy meal to enjoy for a wintery lunch or dinner. Bye-bye January and hello February! Boil the soy cutlets or soy curls in plenty of water for about 10-15 minutes or until completely soft. Drain and rinse carefully with cold water. Squeeze every single cutlet or curl until dry. That way they will absorb all the good stuff from the sauce. If you are using cutlets, cut them into strips after. Heat up a pan, add oil and soy strips. Cook for a few minutes, until the strips become crispier. Add sliced onions. Cook for a couple of minutes until lightly golden brown. Add sliced pickles, black pepper and paprika powder. Stir and cook for a minute. Add flour, stir carefully and cook for a minute. Add boiling water and stir carefully. Cook for 5 minutes. Add cream, tomato sauce, salt and soy sauce. Stir and cook for a couple of minutes. Serve with boiled potatoes, rice, pasta or buckwheat.